During Blissdom 2013, I met some great people from Wholly Guacamole when I attended their fun event. 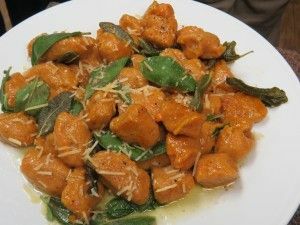 They sent me copies of several recipes and I’d like to share with you a delicious Italian gnocchi recipe by Chef Alex Thomopoulos for Wholly Kitchen Experience. There’s also video instructions below, so you can easily make this for your family and good news is this is a gluten-free recipe. Mix to combine and store in airtight container. Preheat oven to 425 degrees. Fill a large pot with salted water and bring to a boil. Bake sweet potatoes until tender, 40-45 minutes. Scoop out the flesh and mash in a bowl. Measure 2 cups of the mashed sweet potato and place in a bowl. To the sweet potatoes add ricotta, salt, cinnamon, nutmeg, and pepper and mix to combine. Add the flour and mix until fully incorporated. The dough should be sticky and hold together. Divide the dough into thirds. Generously dust your cutting board with extra gluten free flour. Take one section of dough and roll it into a 1-inch log. Cut the log into 1-inch pieces and place on a baking sheet dusted with gluten free flour to prevent sticking. Repeat with remaining dough. Add gnocchi, in batches, to boiling water being careful not to overcrowd, and cook 3-4 minutes or until they float. Remove to a bowl and tent to keep warm. Continue to cook remaining gnocchi. In a skillet melt the butter over medium heat. Once melted add the sage leaves and let them begin to fry. Season with salt and pepper. When the butter begins to brown and the sage leaves crisp slightly add the gnocchi and toss to coat. Finish with the maple syrup. Spoon gnocchi into a serving dish and garnish with Parmesan. Image and this Recipe is by Chef Alex T. for Wholly Guacamole.